Heather Starr Hanegan stands with her daughters, Krysta, Alayna, Tylin and Gracelyn, clockwise from right, on Tuesday at their Harrison home. Less than five months after Heather Starr Hanegan moved from homelessness to housing, her oldest daughter was diagnosed with cancer. 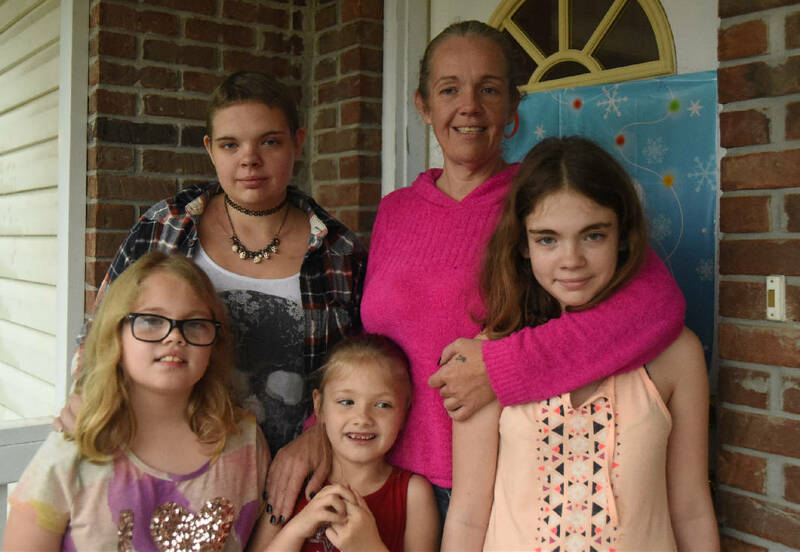 Hanegan, a single mother of four school-aged girls, had no money to get her daughter to the treatment center until the Rhea County United Way drew $150 from the Neediest Cases fund. "It helped me get my child to the hospital in Nashville to get her ready for her transplant," Hanegan said. "She's doing great now." Hanegan's daughter was diagnosed with Hodgkin lymphoma and had a successful stem cell transplant. Hanegan and her 17-year-old stand among hundreds of people helped by Chattanooga Times Free Press readers who contribute to the Neediest Cases funds. Readers contributed more than $47,098 that helped some 300 people during the 2014 season. Giving toward Neediest Cases started this year on Thanksgiving Day and continues until the end of the year. Rhea County United Way officials called the fund a benefit to the community. "As far as I'm concerned, the Neediest Cases fund has been a blessing," said Christine Ralph, Rhea County's United Way director. Ralph assisted Hanegan with getting funds she needed. Rural areas don't have multiple agencies to help people. By the time Rhea County uses the Neediest Cases, it has exhausted all other resources, Ralph said. She said the United Way in Rhea County assisted people in getting Neediest Cases funds for the less than three years. Other case managers said they appreciate Neediest Cases because it helps people without the government restrictions that may come with other funding sources. Hanegan's $150 was enough to bridge the gap so that her daughter could get the treatment that she needed. The Rhea County United Way distributed $2,500 in Neediest Cases funds last year, with those in need getting from $50 to $200. Ralph recalled another family that got $50, but that was enough to pay rent in public housing for a month, until a family member started working, she said. "This has just been a godsend to have something," Ralph said. "Before, we had to tell people there's nothing we can do." Any area nonprofit organization or 501(c)(3) can apply for Neediest Cases funds for its clients by calling the United Way's 211 number. Clients are assessed on a case-by-case basis to ensure funds are distributed in the most efficient manner, according to Diane Jarvis, the United Way's Neediest Cases manager. Contact staff writer Yolanda Putman at yputman@timesfreepress.com or 757-6431.